The Great Temple, or Holy See, is the center of the sect. Constructed between 1933 and 1955, is about 60 miles (100 kilometers) northwest of Ho Chi Minh City. There are colorful ceremonies with chanting four times a day. 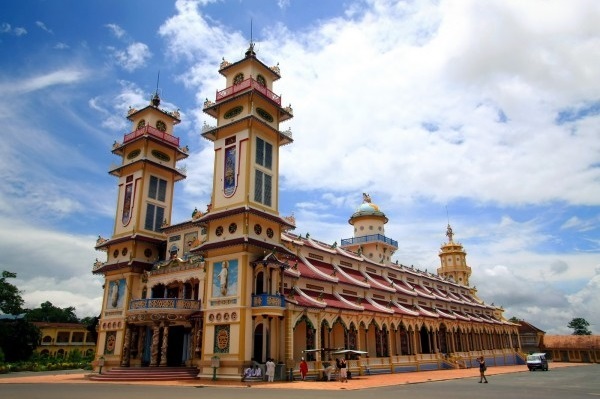 Heading out of town we drive to TayNinh to see the ornate temple of Cao Dai and attend the fantastic mid-day service when the followers fill the hall wearing colored robes, a symbol of the curious combination of the Confucianism, Taoism and Buddhism. Lunch at a local restaurant.Afterwards we continue to the famous Cu Chi Tunnels, which were an incredible underground network constructed by Vietnamese fighters during the long struggle for independence. The tunnels contained hospitals, plus accommodation and schools, and were used as a military base for the Vietcong in the American war. - Mineral water on tour.